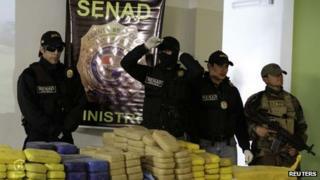 Officials in Paraguay say the amount of drugs seized in the country in 2013 rose by 39%. Paraguay's national counternarcotics body (Senad) said it had seized 461 tonnes of marijuana and 3.3 tonnes of cocaine, up from 176 and 3.1 tonnes respectively. Paraguay is the largest producer of cannabis in South America, much of which is smuggled to Brazil. Senad said it had also eradicated a record amount of marijuana plants. Earlier this month, another South American nation - Uruguay - became the first country in the world to legalise the marijuana trade. Supporters of the Uruguayan law cited the rise in drug growing and trafficking in Paraguay as the negative example they were trying to avoid. According to a 2013 report by the US state department, Paraguay is a "major drug transit country and money laundering centre". Uruguay's President Jose Mujica argued that unless his country took the marijuana trade out of the hands of criminal elements, Uruguay's low murder rate could soon rise as drug-related violence spread. Paraguayan President Horacio Cartes has dismissed his Uruguayan counterpart's move as "utopian". The Paraguayan leader has been accused of links with drug trafficking after a small aircraft laden with cocaine and marijuana landed at one of his ranches in 2000. He said he had nothing to do with the plane, and when the incident was brought up during his 2013 election campaign he dismissed it as "an anecdote". He has also promised to fight "rigorously" against drug trafficking.